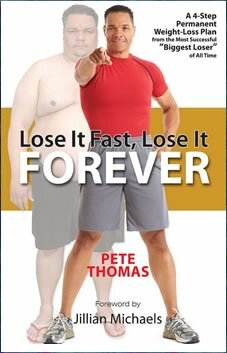 Lose it Fast, Lose it Forever was written by Pete Thomas one of the most successful contestants on the television program, “The Biggest Loser”. When he started he weighed 400 pounds and he lost 185 pounds since he began the show. Now he is a certified personal trainer and motivational speaker. In Lose It Fast, Lose It Forever he shares a plan to help you lose weight and keep it off. This program is based on the methods that have helped hundreds of his students achieve their weight loss goals. Pete Thomas says his book will give you the tools to find the solutions that will work for you. The most important thing is to engage your mind to create new habits that will set you up for success. Dieters are provided with nutritional education and are instructed to monitor their intake of calories and carbohydrates. Breakfast is considered essential because it gets your metabolism going, initiates calorie burning and gets you to the next meal without feeling hungry. You can also control your appetite by consuming plenty of salads, soups and vegetables. Cheat meals are discouraged because they reinforce the idea of food as reward and neutralize much of your hard work. However, if you are really craving a particular food you can simply add it into your calorie budget for the day. According to Thomas the number one tool for successful weight loss is to master your mind. He asks readers to make a solid commitment to losing weight. Additionally he teaches goal setting techniques that help keep you motivated and on track. After you study the mechanics of weight loss you will start to develop your own personalized plan. You will be armed with the knowledge you need to create a meal plan and fitness regime that suits your lifestyle, preferences and goals. Once you have created your customized approach to losing weight you will start to put it into action. You will have developed new skills that allow you to lose weight rapidly for a fast transformation. Pete Thomas shares weight loss secrets and principles that he learned on “The Biggest Loser”. These techniques can help you lose weight fast to get ready for a special occasion or to break through a plateau. The final step is where you celebrate your life as you enjoy your new healthier body. Unlike many other weight loss programs this is not simply a “maintenance” phase. Rather you are encouraged to share your well being and enthusiasm for life by passing your knowledge onto others. Pork loin, lean beef, chicken breast, turkey sausages, shrimp, salmon, tuna, reduced-fat cheese, egg whites, low-carb tortillas, whole-grain bread, quinoa, steel-cut oatmeal, berries, apples, melon, lettuce, spinach, cauliflower, green beans, avocado, pickles, sugar-free Jell-O, fat-free Cool Whip, low-fat mayo, Crystal Light. Fitness is an essential component of this program and you are encouraged to workout for 60-90 minutes, six days a week. If you want to lose weight faster you have the option to do even more exercise. The fitness program involves a combination of cardiovascular activity and strength-training. Lose It Fast, Lose It Forever: A 4-Step Permanent Weight Loss Plan from the Most Successful “Biggest Loser” of All Time retails at $26. Click Here to purchase this diet at a discounted price. Allows you to customize the diet and exercise plans to suit your personal preferences. Encourages dieters to take responsibility for their health. 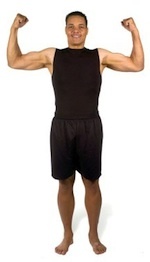 Offers educational information about exercise and nutrition. Includes guidelines to help promote rapid weight loss or to break a plateau. Will appeal to fans of “The Biggest Loser”. Weight loss may be slow in the beginning stages. Encourages the use of processed “diet foods” that often contain artificial ingredients. Requires calorie counting and restricting the intake of carbohydrates. Does not contain recipes or a structured meal plan. Necessary to spend time creating your own menus and fitness program. Thomas encourages readers to make gradual changes while implementing new habits to create a lifestyle that promote healthy weight loss. The strength of this program is that it allows you to customize the diet and fitness plans to suit your individual preferences. This increases the likelihood that you will stick with the plan and fully integrate health-supportive behaviors into your life.